I adapted this recipe from [%amazonProductLink asin=1579654150 "The Frankies Spuntino Kitchen Companion & Cooking Manual." 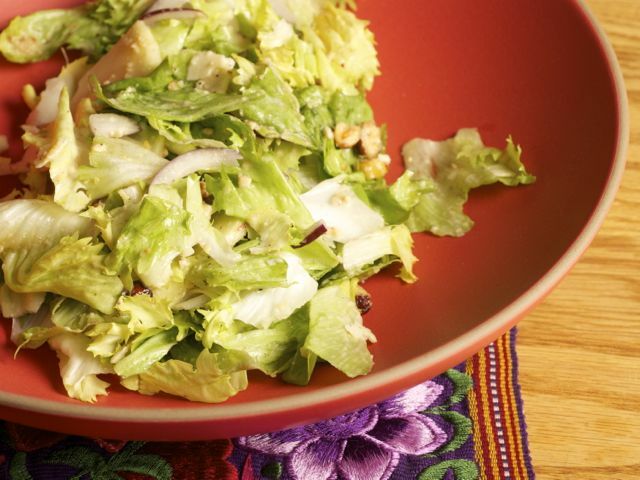 newpage=true] It's a Pacific-Northwestern adaptation of their delicious escarole, walnut, red onion, and Fiore Sardo salad. The pungency of raw onion and the tart sweetness of apples make this salad the perfect antidote to overly rich winter meals, and leftovers are just as good the next day. Make the dressing: Combine all of the ingredients in a food processor and whirl until emulsified. The hazelnuts may make this very, very thick, almost like a mayonnaise; if it seems too thick, thin to your preference by whisking in additional tablespoons of water or vinegar. Taste for seasonings, and adjust if necessary. Prep the escarole: Wash the escarole thoroughly before slicing it into bite-sized pieces. Then, since escarole can be very sandy and nothing is less fun to eat than a gritty leaf, wash the cut pieces again and dry them thoroughly. Assemble the salad: Put the escarole in a large salad bowl. Add the apples, onions, and cheese, then toss with enough dressing to thoroughly coat. Scatter the hazelnuts on top just before serving, so everybody is sure to get some and they don’t all fall sadly to the bottom of the bowl. Culinate editor's note: Because of its creamy texture and garlicky flavor, the salad dressing here makes an excellent vegetarian take on a classic Caesar dressing.